"My yachts were, I suppose, outstanding status symbols." - J. Paul Getty. "Yachts are the closest a commoner can get to sovereignty." - Charles Simonyi. "Nobody who has to ask what a yacht costs has any business owning one." - J. Pierpont Morgan. "You can do business with anyone but you can only sail on a boat with a gentleman." - J. Pierpont Morgan. "Money can't buy you happiness, but it can buy you a yacht big enough to pull up right alongside it." - David Lee Roth. "The two happiest days of a man’s life - the day he bought the boat and the day he sold the boat. Everything in between is expenditure." - Common saying in the boating world. A YACHT is a high end recreational boat. It designates two rather different classes of watercraft, sailing and power boats. Yachts are different from working ships mainly by their leisure purpose. It was not until the rise of the steamboat and other types of powerboat that sailing vessels in general came to be perceived as luxury items. However, since the level of luxury on larger yachts has seen an increasing trend, the use of the word yacht to mean any sailing vessel has been diminishing and is more and more limited to racing yachts or cruising yachts. Yacht lengths generally range from 20 feet (6 m) up to hundreds of feet. Luxury crafts smaller than 40 feet are more commonly called "cabin cruisers" or simply "cruisers." A mega yacht generally refers to any yacht (sail or power) above 98 ft (30 m) and a super yacht generally refers to any yacht over 197 ft (60 m). The term luxury yacht, "SUPERYACHT" and "Large Yacht" refers to very expensive, privately owned yachts which are professionally crewed. Also known as a Super Yacht, a luxury yacht may be either a sailing or motor yacht. This term began to appear at the beginning of the 20th century when wealthy individuals constructed large private yachts for personal pleasure. This coincided with it being picked up by the press as well, and its appearance in magazines such as Boat International, cemented it as an every day term in the industry. Examples of early luxury motor yachts include the Cox & King yachts, M/Y (motor yacht) Christina O and M/Y Savarona. Early luxury sailing yachts include Americas Cup classic J class racers like S/Y (sailing yacht) Endeavour and Sir Thomas Lipton's S/Y Shamrock. The New York Yacht Club hosted many early luxury sailing yacht events at Newport, Rhode Island, during the Gilded Age. Between 2000 and 2008 there was a massive growth in the number, size, and popularity of large private or Super luxury yachts. This was in the 24 to 70 meter size range. Luxury, Large or Super yachts typically have no real home port as such although a yacht must be registered in a port of the country to which flag state it is registered in. Popular flag state registrars for large yachts are Cayman Islands, Marshall Islands, Isle of Man, British Virgin Islands among others. (Many times the yacht will have never been to these ports.) They are particularly bountiful in the Mediterranean in summer and the Caribbean Sea in winter. Many can be chartered (rented) for sums of up to 1 million Euro for a week. There may be up to 1500 Large yachts available to Charter in a season in the Mediterranean. (Yachts that go back and forth between the Caribbean and Mediterranean in the winter and summer are said to be doing the Milk Run.) The arrival of large commercial ships that have been specially outfitted to take multiple Large yachts across the Atlantic ocean have created a much larger Charter market in the Caribbean than ever before. Yachts will dock in a port of choosing while the crew does maintenance work and waits for owners or guests to arrive. The vessels then will do short cruises with the owners and/or guests aboard. Typical destinations in Spain and the French and Italian Rivieras include Cannes, Antibes, St. Tropez, Monte Carlo, Portofino, Porto Cervo, Puerto Banus, Puerto Portals and Palma, Majorca, although increasingly luxury yachts are cruising in more remote areas of the world. Antigua is one of the main ports in the Windward Islands of the Caribbean and hosts a Charter Show at the beginning of the winter season. While the demand for new luxury yachts has slowed somewhat since 2009, 2011 has seen a small rebound with launches from many of the top yards. The latest launch, M/Y Eclipse, built by Blohm + Voss for Russian businessman Roman Abramovich is the largest yacht in the world. Luxury boat building and yacht charter companies are predominantly based in the United States and Western Europe but are also increasingly found in New Zealand, Asia and Eastern Europe. A SAILING YACHT (US ship prefix SY or S/Y) is a leisure craft that uses sails as its primary means of propulsion. Sailing yachts are actively used in sport and are a category of classes recognized by the International Sailing Federation. 10 biggest yachts at the 2018 Monaco Yacht Show - CNN. 15 MOST RIDICULOUS YACHTS IN THE WORLD - YouTube 10:20. 100 LARGEST YACHTS 2017 - Superyachts.com. 200 largest superyachts in the world - Boat International. 300 LARGEST YACHTS - TheYachtPhoto.com. 345-ft 'gap year' superyacht unveiled - "'Millennial' superyacht makes waves at Dubai boat show." 2017 Monaco Yacht Show's best superyachts - The Telegraph. 2018 forecast: Largest yachts arriving - Superyachts.com. 6,281 superyachts - Superyacht Intelligence Consultancy. Aston Martin Submarine - "Aston Martin is making an ultra-exclusive $4 million submarine." CNN Money. best new superyachts 2017 - The Telegraph. 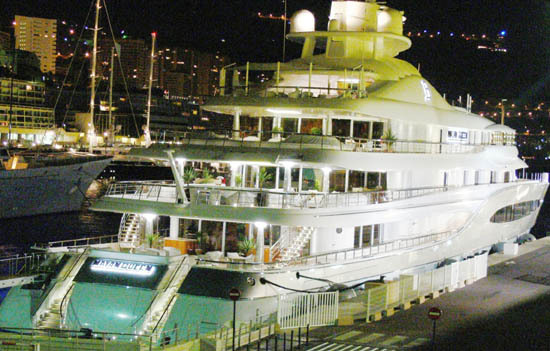 Billionaire Superyacht Showdown: Who's Who at Cannes Film Festival - Forbes. Can a superyacht cross the Atlantic without using fuel? 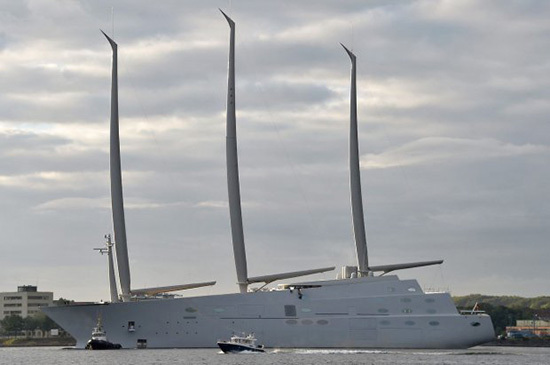 - "'Crossing the Atlantic with no fuel:' Can superyachts really go green?" Cybercrime on the high seas: the new threat facing billionaire superyacht owners - The Guardian. Flag of convenience - Wikipedia. GIGA YACHT - definition & explanation. How to design a luxury superyacht - "When super-rich clients spend tens of millions on a superyacht, they expect something unique." how to snap up a superyacht at the Monaco Yacht Show - The Telegraph. Inside the secret world of superyachts - GQ. LIST OF LARGE SAILING YACHTS - Wikipedia. LIST OF MOTOR YACHTS BY LENGTH - Wikipedia. Lock & Co. Hatters Skipper cap - established 1676. 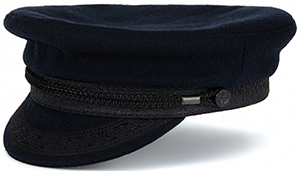 "The hat choice for sailing enthusiasts, the Skipper cap is crafted from showerproof navy wool. The authentic black-braid detailing and embellishments make this cap the ultimate in marine style." Luxury yacht tender - Wikipedia. MEGA YACHT - definition & explanation. 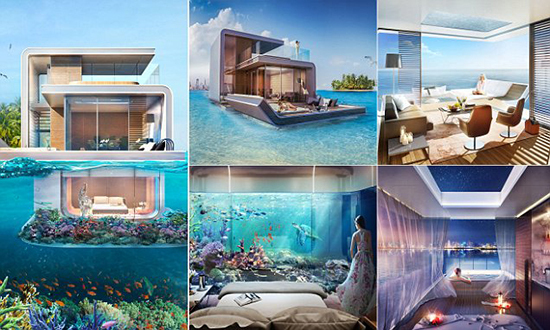 Neyk Luxury Submarine - Ocean Submarine. Roman Abramovich loses 'world's biggest yacht owner title' - Mail Online. SHADOW YACHT - definition & explanation. Successor to new Britannia moves closer - The Telegraph. SUPER YACHT - definition & explanation. 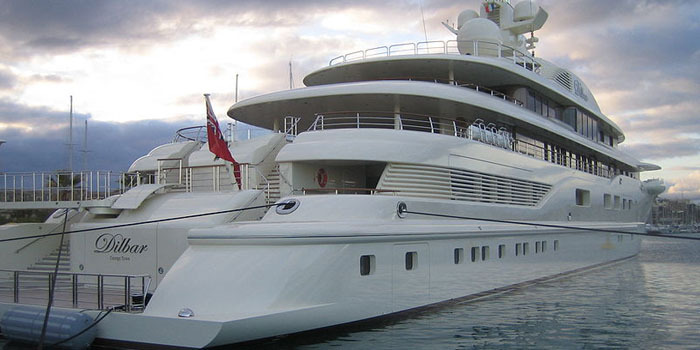 Superyacht cybercrime: the next big thing? - CNN. Superyachts just got bigger, greener, sexier - "Bigger, greener, sexier, more adventurous: Superyachts of the future revealed." The Most Expensive Yacht In The World - YouTube 10:58. "Join us while we take an inside look at the most expensive yacht ever built. The History Supreme is a $4.8 billion dollar masterpiece!" The secrets behind world's most famous superyacht - designer Philippe Starck reveals how the £225 million Motor Yacht A came to be. This superyacht could be world's biggest - "This floating entertainment hub could be biggest superyacht in the world." World's Largest Ship - 400-meter long Triple-E vessel: Mærsk Mc-Kinney Møller. World's largest superyacht with 41,000 sq ft of living space - Daily Mail. world's most beautiful new superyachts - The Telegraph. Yacht Fire M/V Polar Bear - YouTube: 3:32. 46' Cigarette Rider - inspired by the Mercedes-Benz SLS AMG supercar. 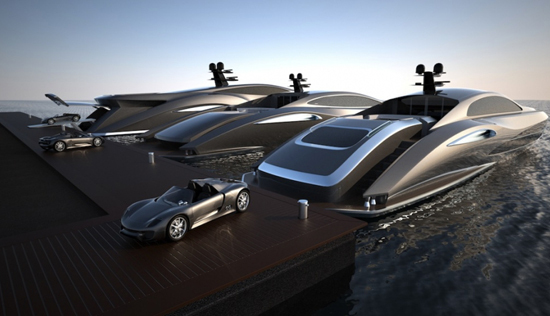 122 STRAND CRAFT SUPERYACHT - comes with supercar and in-boat garage to hold it. A (motor yacht) - Philippe Starck designed mega yacht. 390 ft / 119 m / US$300 mio. (owned by Russian billionaire Andrey Melnichenko). A (sailing yacht) - 469 ft / 143 m / height: ~100 m (330 ft) / US$300 mio. (owned by Russian billionaire Andrey Melnichenko). ADASTRA - 136.15 ft / 41.5 m / US$14.5 mio. (owned by shipping magnate Anto Marden). AERO CRUISER 38 II - 'SHOOTING STAR' - "The new 38 metre superyacht from Danish Yachts known as ‘AeroCruiser 38 II’ is designed by Espen Øino and set to pioneer a new era in powerboat design. The carbon-fibre superyacht is the fastest twin-engined superyacht of its class capable of over 50 knots!" 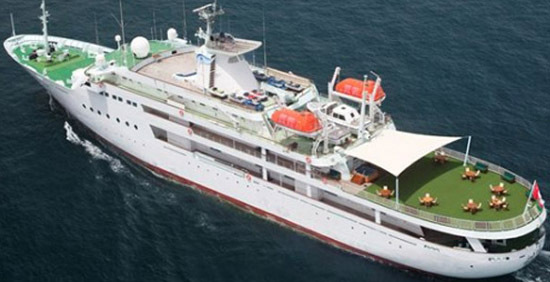 Al Diriyah - 258 ft / 79 m (owned by the Saudi royal family). Al Mirqab - 437 ft / 133 m (owned by the Hamad bin Khalifa Al Thani, Emir of Qatar). 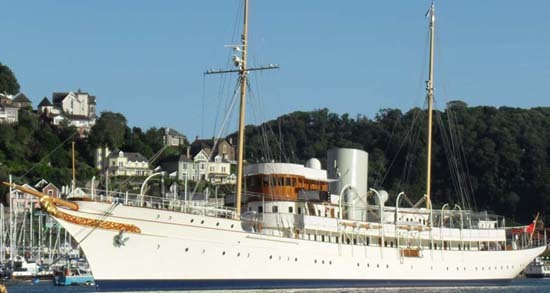 AL SAID - 508.5 ft / 155 m (owned by the Sultan of Oman). 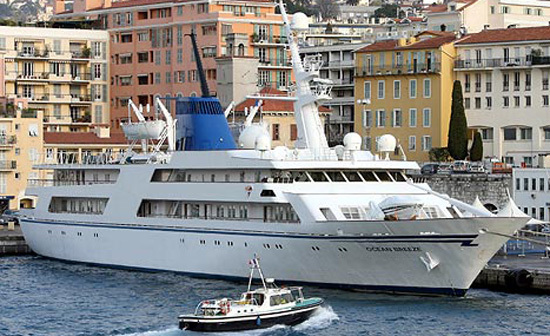 AL SALAMAH - 457 ft / 139 m (owned by the Sultan, Crown Prince of Saudi Arabia). 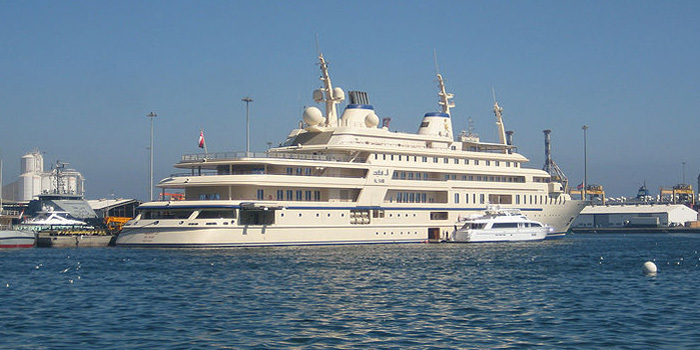 ALAMSHAR - 164 ft / 50 m / US$200 mio. (owned by Aga Khan IV). Alexander - 400 ft / 122 m (owned by the Latsis family). 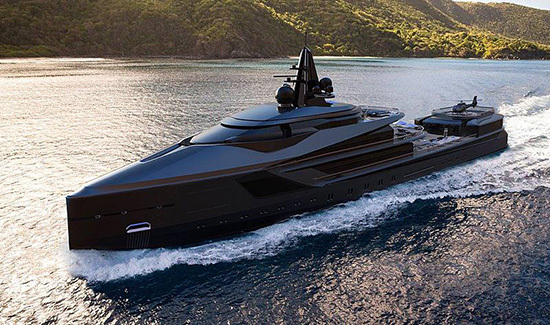 Alfa Nero - 269 ft / 82 m.
ALYSIA - 280 ft / 85 m / US$116 mio. One of the world’s most impressive charteryachts along with her sistership Annaliesse. Amazon Express - 219 ft / 67 m (owned by the Jean Pigozzi). 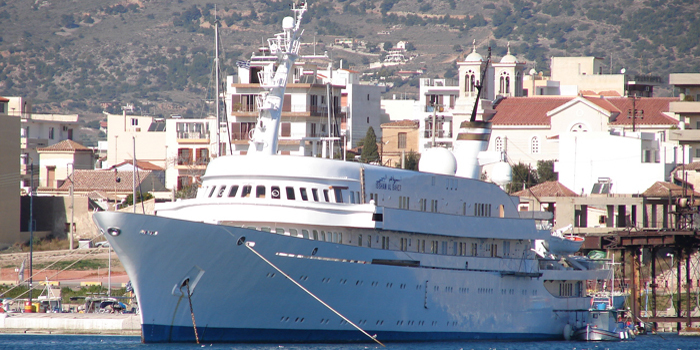 Amevi - 262 ft / 80 m (owned by the Lakshmi Mittal). 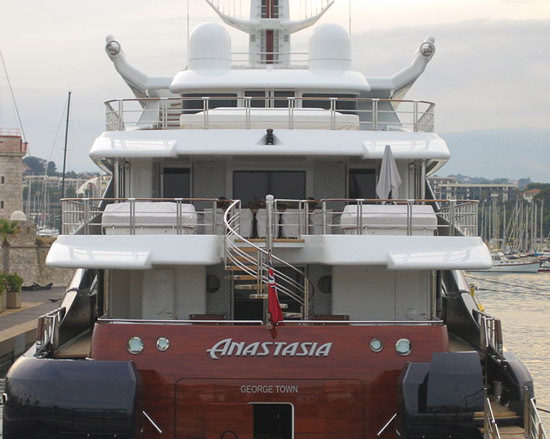 Anastasia - 248 ft / 76 m (owned by Vladimir Potanin). 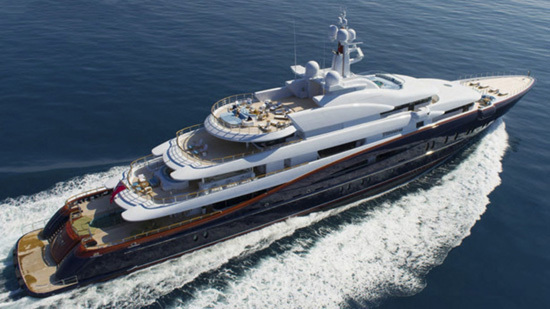 ANNALIESSE - 280 ft / 85 m / US$103 mio. 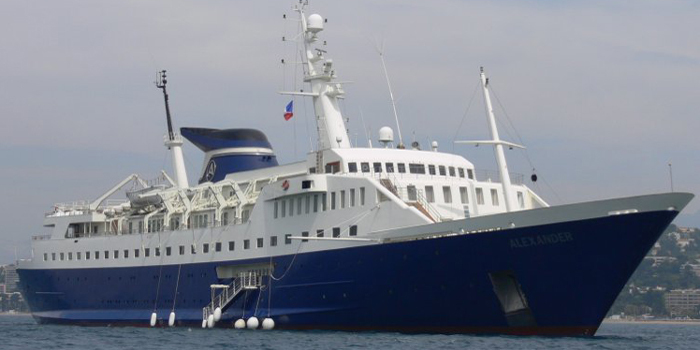 (one of the world’s most impressive charteryachts along with her sistership Alysia). AQUARIVA BY GUCCI - exclusive made-to-order yacht by Riva and Gucci in collaboration with Officina Italiana Design. April Fool - 200 ft / 61 m / US$69,5 mio. Arctic P - 289 ft / 88 m (owned by James Packer). Arrow460-Granturismo - 46 ft / 14 m. "Silver Arrow of the Seas." The luxury motor yacht designed by Mercedes-Benz Style. Price: US$1,7 mio. Asean Lady - 289 ft / 88 m (owned by Brian Chang & Vincent Tan). 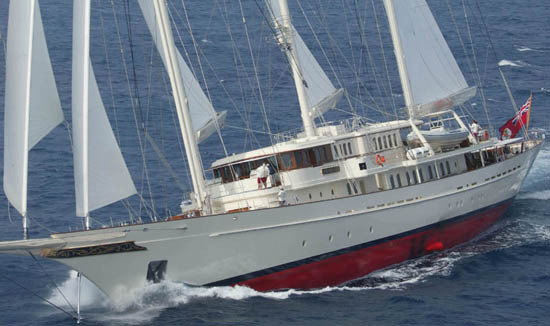 ATHENA - 295 ft / 90 m / US$100 mio. (owned by the James H. Clark). World's largest three masted schooner. Atlantis II - 380 ft / 116 m (owned by the Niarchos family). Attessa IV - 328 ft / 100 m (owned by Dennis Washington). Aviva - 223 ft / 68 m (owned by the Joe Lewis). 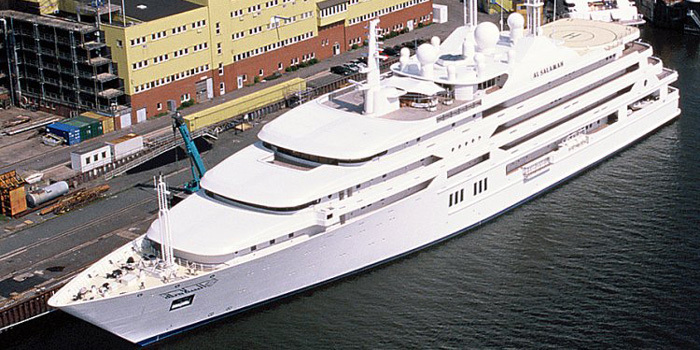 Azzam - the world's largest yacht: 590 ft / 180 m / £400 mio. Launched on 5 April 2013. 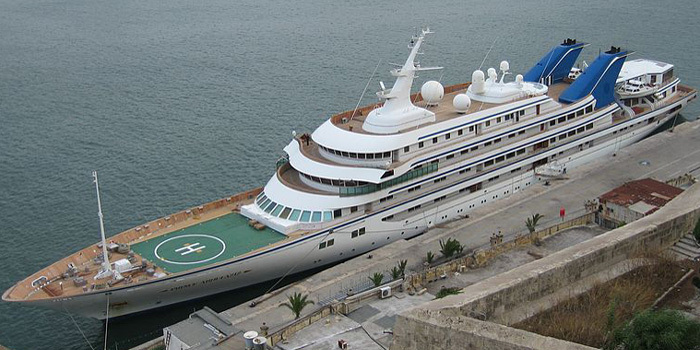 At 180 m (590 ft) in length she is the largest private yacht in the world. She has a beam of 20.8 m (68'4") and an unusually shallow draught of 4.3 m (14'1"). Exterior design by Nauta Yachts and interior design by Christophe Leoni. The yacht has a main saloon with a length of 29 m and a beam of 18 m with an open plan and no pillars. She will travel in excess of 30 knots, powered by a combination of two gas turbines and two diesel engines with a total power output of 70 MW (94,000 hp) through four pump-jets, 2 with non moveable round water outlets in the middle of the stern and 2 with thrust vectoring capabilities using moveable duct water outlets positioned on either side of the non moveable ones. 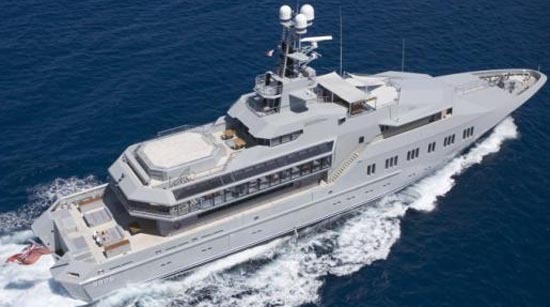 Azzam was built for Sheikh Khalifa bin Zayed al-Nahyan, the president of the United Arab Emirates and emir of Abu Dhabi. BANNENBERG & ROWELL DESIGN - award winning yacht design. BIG FISH - 147 ft / 45 m. Built ruggedly to ocean-going specifications, the full-displacement steel hull, aluminum superstructure vessel is capable of a 10,000-mile range and three full months of independent cruising. For charter from: US$$245,000. C2 - 257 ft / 78 m.
C-EXPLORER 5 - tour submersible (5 persons 50M-1000M): 966,000. CAKEWALK - 281 ft / 85.6 m / 2,950 tons. Built in 2010. The largest yacht built in the U.S. since the 1930s, and possibly the biggest ever built in the States when measured by volume. Listed for sale via Burgess at US$215 million. Carinthia VII - 319 ft / 97 m (owned by Heidi Horten). M/Y CHRISTINA O - 325 ft / 99 m (Aristotle Onassis would be proud of his totally rebuilt superyacht now for charter). Constellation - 289 ft / 88 m.
Cosmos - 317 ft / 97 m.
Creole - 214 ft / 63 m. Classic luxury triple masted schooner created at Camper & Nicholsons in 1927. 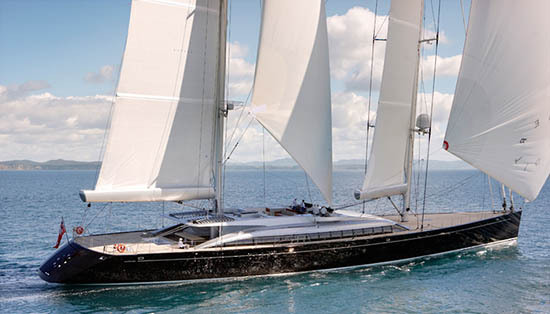 Creole is the largest wood sailing yacht in the world, currently owned by the Gucci family. The yacht's interior has been designed by Toto Russo and has exterior styling by Charles E. Nicholson. Creole offers accommodation for up to 10 guests. She is also capable of carrying up to 16 crew onboard to ensure a relaxed luxury yacht experience. Cutty Sark - 263 ft / 80 m. Built, from plates originally destined for an S class destroyer, by Yarrow and Co Ltd of Scotstoun for Major Henry Keswick (1870–1928) of Jardine’s. She was launched on 18 March 1920. In 1926 the Duke of Westminster acquired the Cutty Sark, cruising her from North Norway to the Red Sea. Up to the Second World War, she became a familiar sight at Cowes, Biarritz, the Mediterranean and the west coast of Scotland. HDMY Dannebrog - 257 ft / 78 m (owned by Margrethe II of Denmark). Delma - 280 ft / 85 m (owned by the Constantine Alexander-Goulandris). SS DELPHINE - 258 ft / 79 m / 1,961 tons / 38 mio. 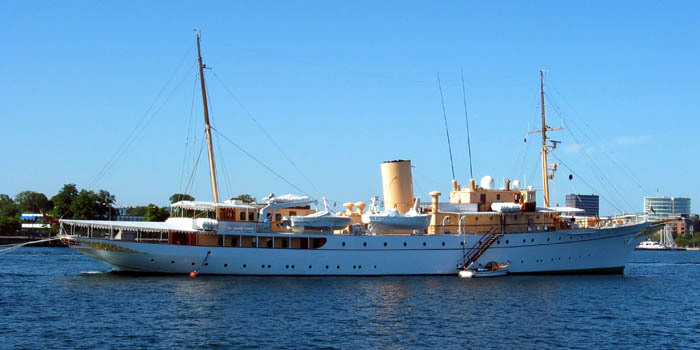 America's largest private steam yacht launched on April 2, 1921. Dilbar - 512 ft / 157 m / US$600 mio. (owned by Alisher Usmanov). Dilbar is the world’s biggest yacht measured by volume. (Azzam is longer, but with less volume). DUBAI - 525 ft / 160 m / US$350 mio. (owned by the Emir of Dubai). Dubawi - 297 ft / 91 m (owned by the Sheikh Hamdan bin Mohammed Al Maktoum). 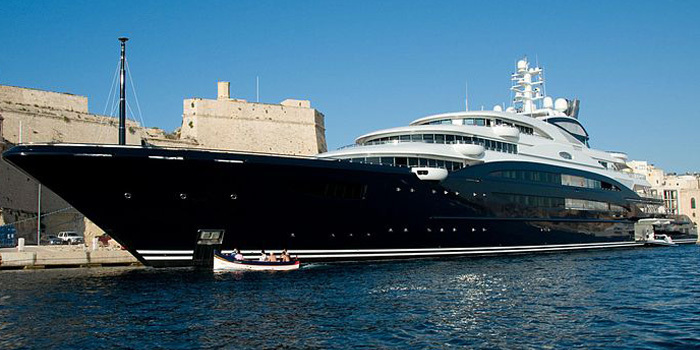 Ebony Shine - 249 ft / 76 m.
M/Y ECLIPSE - world's second-biggest yacht: 538 ft / 164 m / £300 mio. (owned by Roman Abramovich). ECSTASEA - 282 ft / 86 m / US$129 mio. (owned by Roman Abramovich). EL HORRIA - 478 ft / 145 m (owned by Egyptian Navy). 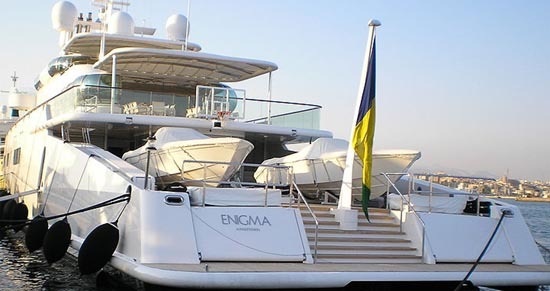 Enigma - 244 ft / 75 m (owned by the Aidan Barclay). 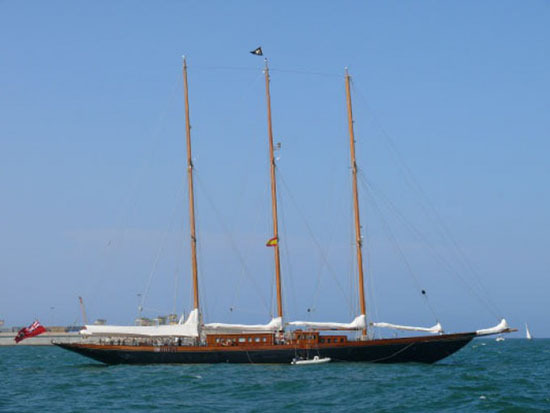 EOS - 305 ft / 93 m. Three-masted Bermuda rigged schooner owned by Barry Diller. Esquel - 345 ft / 105 m. Oceanco has created Esquel in collaboration with Timur Bozca Design, stylist Gina Brennan, Lateral Naval Architects and Engineering, and Pelorus - a leading experiential and yacht expedition travel company. GarÇon - 219 ft / 67 m. Supply tender. Equipped with every explorer style tender or toy available. With a Bell 365 helicopter, five large tenders ranging in size from 14 meters to 10 meters, a 4 man submarine, a complete custom diving cabin, and numerous jet skis, wave runners and sea bobs. GHOST G180H - world's first full hybrid superyacht. Giant I - 246 ft / 75 m.
GO-FAST BOAT - designed for powerboat racing. 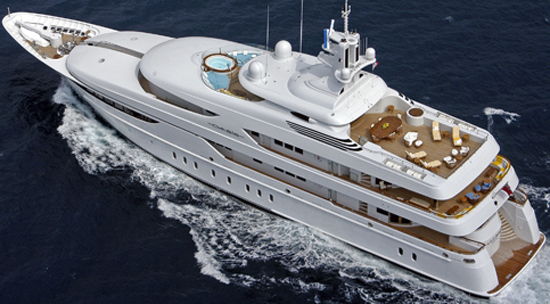 Golden Odyssey - 263 ft / 80 m (owned by the Khalid bin Sultan). GREENLINE 33 HYBRID - European Powerboat of the Year 2010. 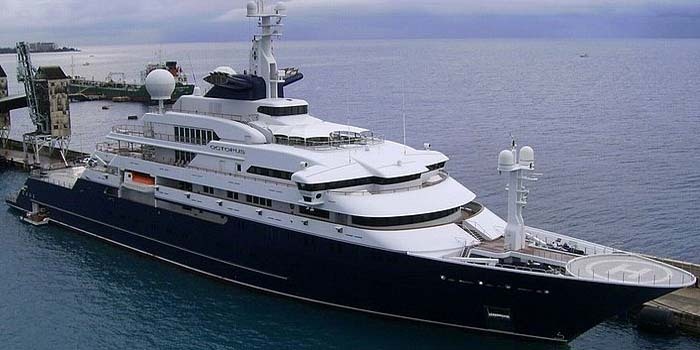 History Supreme - 100 ft / 30 m. Most expensive yacht ever built: US$4.5 billion / £3 billion. Plated with 100 000 kg of gold and platinum. On the inside we can find a statue made out of a T-Rex’s bone and many other extravagant pieces such as meteorite parts. Also on board is a luxury liquor bottle featuring an 18.5ct diamond, one of the world’s rarest. The project took 3 years to complete and was designed by jeweller Stuart Hughes and makes it the most expensive yacht in the world. Owned by an anonymous Malaysian businessman, assumed to be Robert Kuok. Ice - 299 ft / 91 m (owned by Suleyman Kerimov). 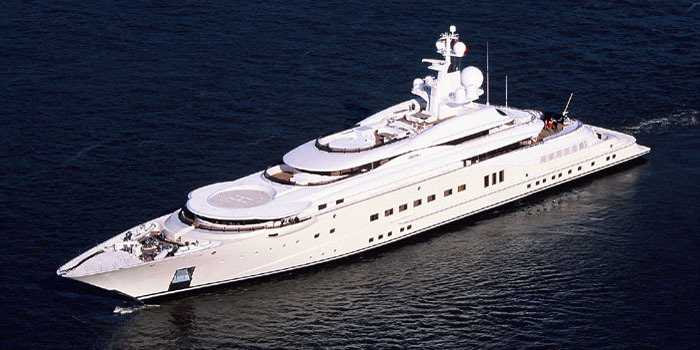 Indian Empress - 312 ft / 95 m (owned by Vijay Mallya). Infinitas - 300 ft / 91 m (designed by E. Kevin Schopfer with Sparkman Stephens, Naval Architects for Schöpfer Yachts). 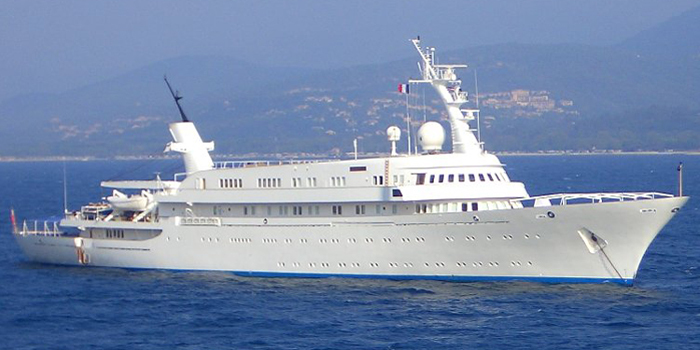 Issham Al Baer - 380 ft / 116 m (formerly the original Atlantis built for Stavros Niarchos at Hellenic Shipyards in 1973, and ex: Prince Abdulaziz, Al Salamah). Jubilee - 361 ft / 110 m / US$310 million / Speed: 18.5 Knots. Largest Yacht Ever To Attend Monaco Yacht Show. KATARA - 408 ft / 124 m.
KINGDOM 5KR - 282 ft / 86 m / US$100 mio. (owned by Prince Al-Waleed bin Talal). Lady Moura - 344 ft / 105 m / US$210 mio. (owned by Nasser al-Rashid). 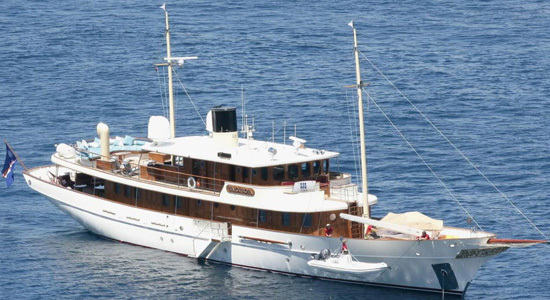 Lady Sarya - 250 ft / 76 m (owned by Sheikh Ahmed Zaki Yamani). 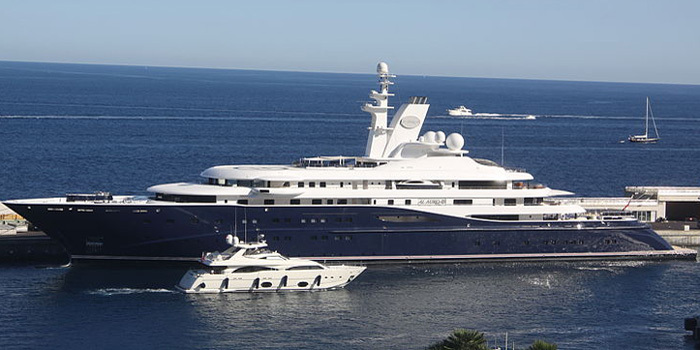 Lauren L - 290 ft / 89 m.
Le Grand Bleu - 370 ft / 113 m (owned by the Eugene Shvidler). Leander G - 246 ft / 75 m (owned by the Sir Donald Gosling). Limitless - 316 ft / 96 m (owned by Lex Wexner). Lionheart - 302 ft / 92 m / £100 million. (owned by Sir Philip Green). 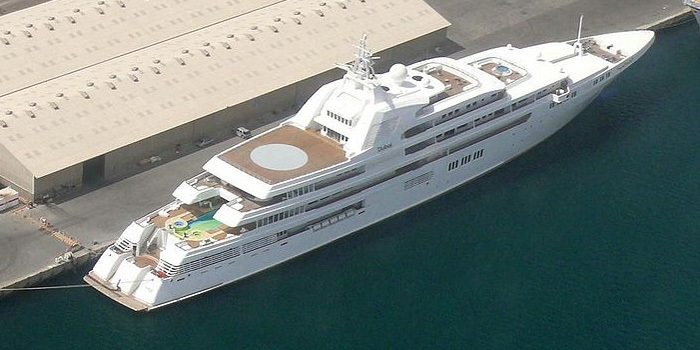 Loaloat Al Behar - 344 ft / 105 m (owned by Qaboos bin Said al Said). Lone Ranger - 254 ft / 77 m (owned by Peter B. Lewis). 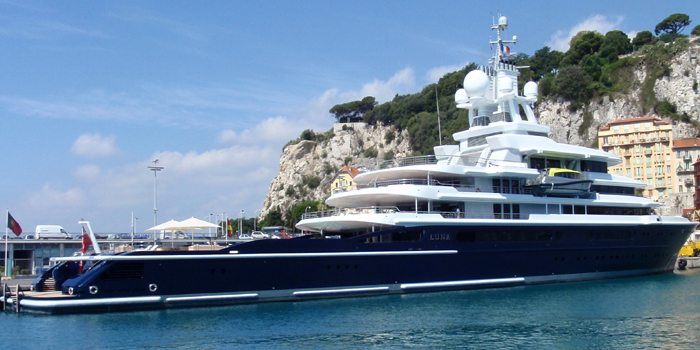 LUNA - 380 ft / 116 m (owned by the Roman Abramovich). MADIZ - 182 ft / 55 m / 7,800,000. MAGNUM 80 - designed by Pininfarina, this new Magnum model is the fastest high performance luxury yacht in its class in the world. 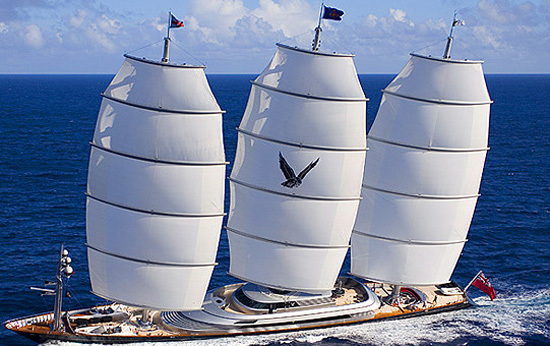 MALTESE FALCON - 289 ft / 88 m / US$120 mio. World's most advanced high tech sailing yacht. Owned by Elena Ambrosiadou. MANGUSTA 165 - 165 ft / 50 m / 29,500,000. Mayan Queen IV - 306 ft / 93 m (owned by Alberto Baillères). 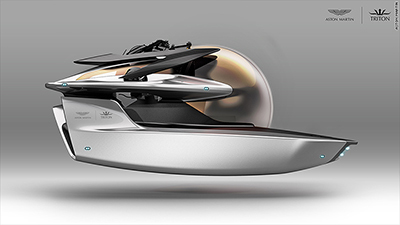 Migaloo Private Submersible Yacht - the first submarine-superyacht hybrid. The ship is 377-feet long, 11-metres wide, and has 6 decks; and can reach a maximum depth of 240m below the surface. MIRABELLA V - 247 ft / 75 m / US$50,000,000. 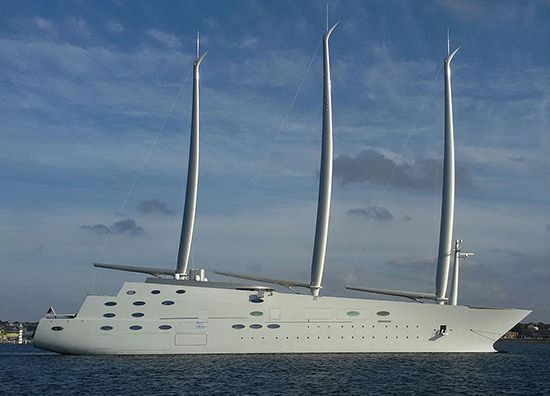 The largest single-masted yacht ever built. Montkaj - 256 ft / 78 m (owned by Muhammad bin Fahd). Moonlight II - 280 ft / 85 m (owned by Sheikh Sultan Bin Khalifa Al Nahyan). M/S Nadine - 167 ft / 51 m (built in 1961 for Coco Chanel. Latest owner Jordan Belfort featured in the The Wolf of Wall Street (2013 film)). Nahlin - 300 ft / 91 m (owned by James Dyson). 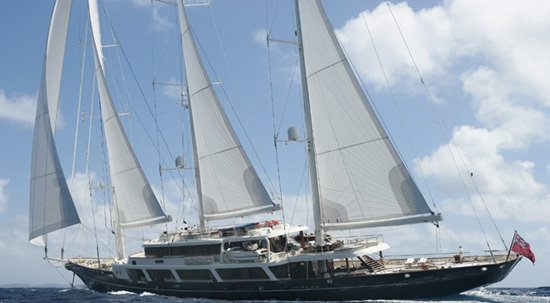 NECKER BELLE - Sir Richard Branson's yacht: 32m long, 14m wide, 171 tons, mast height: 38 m, charter rate: US$100,000 weekly. NERO - 296 ft / 90 m. Inspired by the the Corsair yachts owned by the late J.P. Morgan & J.P. Morgan Jr.: 295 ft /90 m classic motor yacht / US$105 mio. Built at YANTAI RAFFLES SHIPYARD. 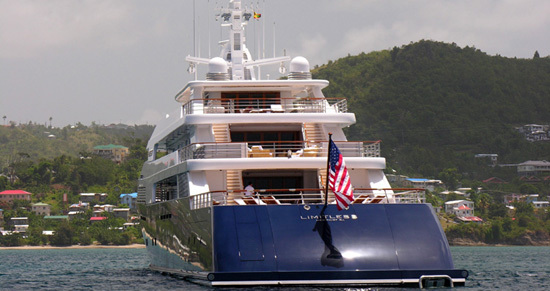 Charters through Burgess Yachts at a weekly base rate of about US$431,000. 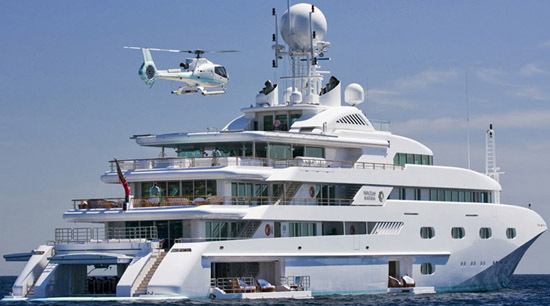 Nirvana - 290 ft / 88.5 m. Launched by Oceanco February 2012. Listed for sale on BoatInternational.com by Edmiston & Company: 230,000,000 (approx. US$312,458,000). 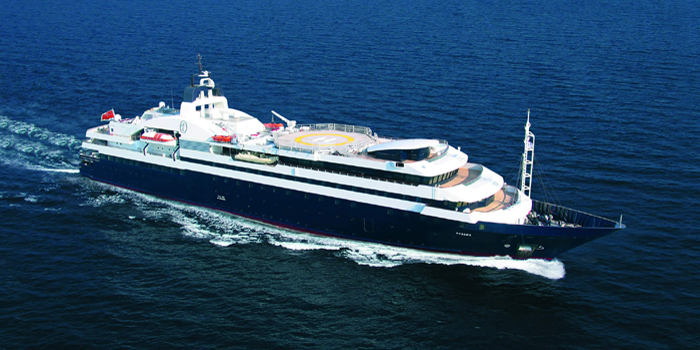 NORTHERN STAR - 247 ft / 75 m / 115 mio. Designed by Espen Øino with a voluminous interior by British designer Pauline Nunns. NorthWind II - 150 ft / 46 m. Classic 1960s luxury motor yacht, notable for the historic importance of her design. Built in 1966 at Camper and Nicholsons in Southampton, England. 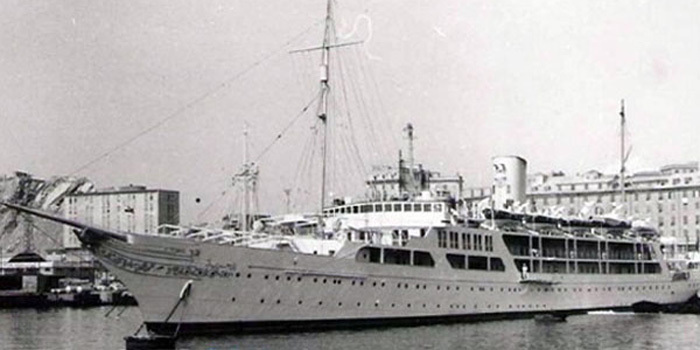 Launched as Chambel IV, she was renamed by her present owner Greek shipping family in 1970. Her interior was decorated by Maison Jansen, the renowned French design firm whose clients included the Kennedy White House, Coco Chanel, the Rockefellers, King Leopold II of Belgium, and the Shah of Iran. Maison Jansen closed in 1989. NVC 85 Y - Rolls-Royce Marine to launch a line of superyachts (279 ft / 85 m) with Paul Madden's Atlantic Yachts. The venture plans to deliver a maximum of 2 US-built and European-designed and engineered megayachts per year expected to cost one-third less and delivered in half the time as comparable European-built megayachts. Ocean Breeze - 269 ft / 82 m (owned by the Federal government of Iraq). OCEAN EMERALD - Norman Foster designed superyacht. 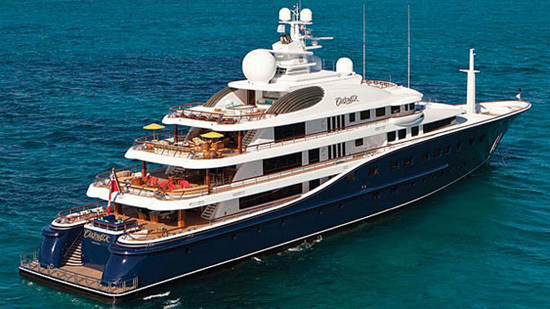 135 ft / 41 m.
Ocean Victory - 249 ft / 76 m.
OCTUPUS - 414 ft / 126 m / US$200 mio. (owned by Microsoft's late co-founder Paul Allen (1953-2018)). 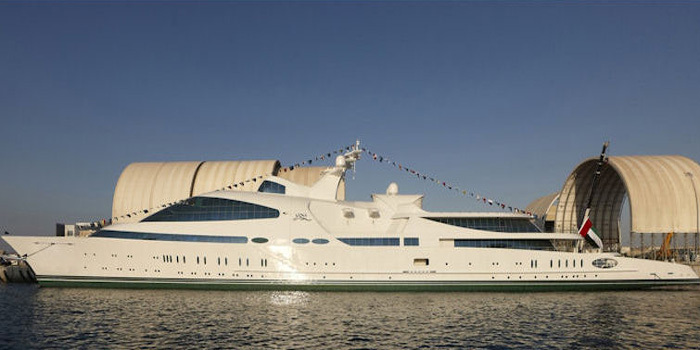 O'Mega - 270 ft / 82 m.
Palladium - 312 ft / 95 m (owned by Mikhail Prokhorov). 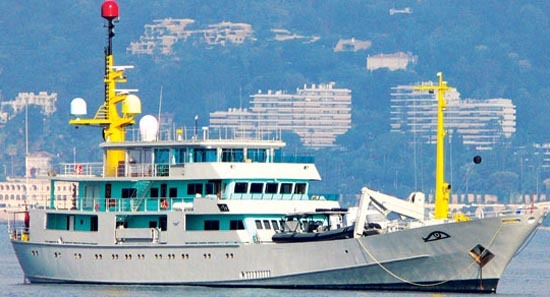 Pegasus V - 258 ft / 79 m.
PELORUS - 377 ft / 115 m / US$160 mio. (owned by Roman Abramovich). Phoenix 2 - 297 ft / 90.5 m.
PJ WORLD YACHT - 82 meter Ice Class superyacht capable of traversing the most remote regions in the most challenging conditions by Palmer Johnson Boats. PRINCE ABDULAZIZ - 482 ft / 147 m (owned by Abdullah of Saudi Arabia). 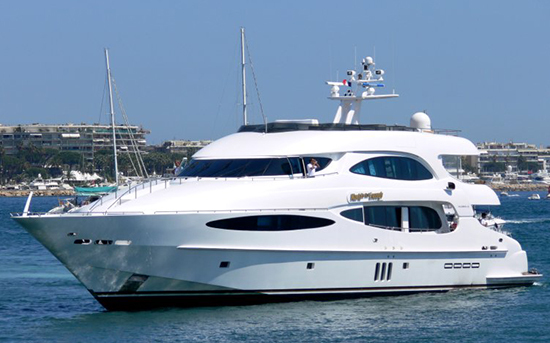 PRINCESS 32M - 105 ft / 32 m / US$11 mio. Built by the LVMH-owned UK-based yacht builder Princess Yachts. 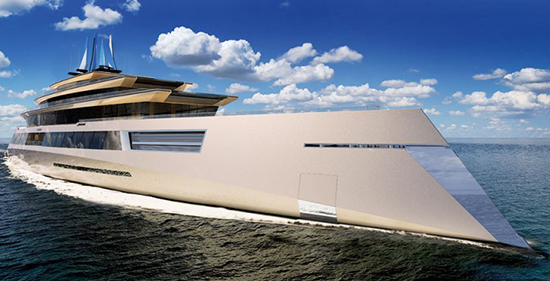 Project Azzam - introducing the world's new largest yacht. PROTEUS - first full-size WAM-V (Wave Adoptive Modular Vessel). Radiant - 361 ft / 110 m (ex: Darius). 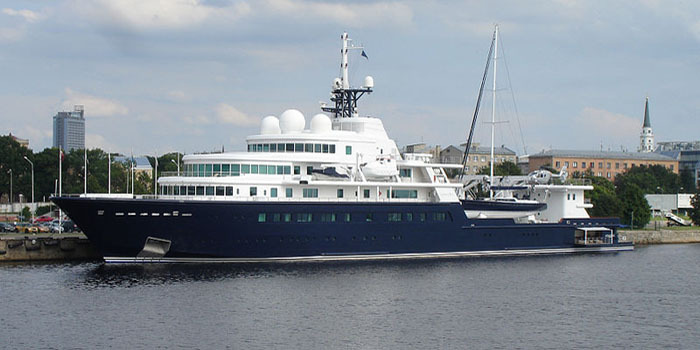 Reverie - 230 ft / 70 m (owned by the Phipps family). RFF 135 - by Porsche Design is crafted for the new generation yacht owner. RISING SUN - 453 ft / 138 m / US$200 mio. (owned jointly by Larry Ellison & David Geffen). 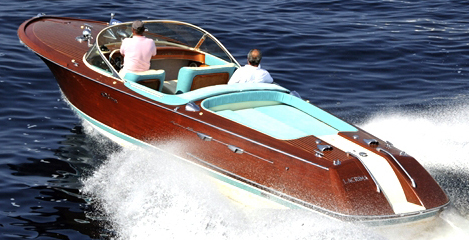 RIVA - since 1842. All models. 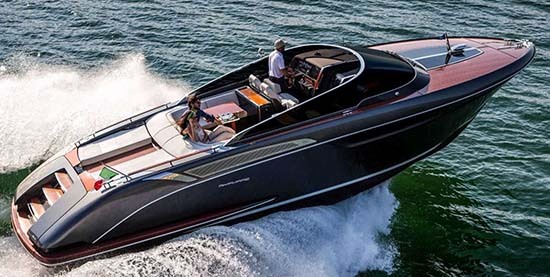 Riva Rivamare - "A Riva needs no introduction, this is hull #1 of the stunning new model Riva Rivamare." Samar - 252 ft / 77 m (owned by the Kutayba Youssef Ahmad Alghanim). Savannah - 273 ft / 83.50 m. "The world’s first hybrid superyacht". SAVARONA - 446 ft / 136 m. The largest private, historic yacht in the world. Sea Cloud - 359 ft / 110 m. Launched April 25, 1931 as Hussar V (1931–35), owners: Edward Francis Hutton & Marjorie Merriweather Post, Angelita, Patria, Antarna. 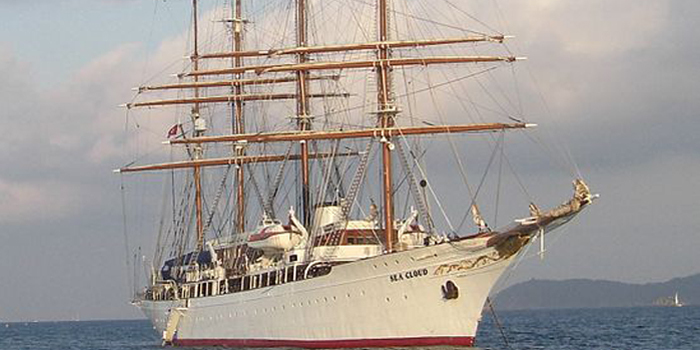 Originally a private yacht, she was transferred to the Coast Guard and then to the Navy during World War II. 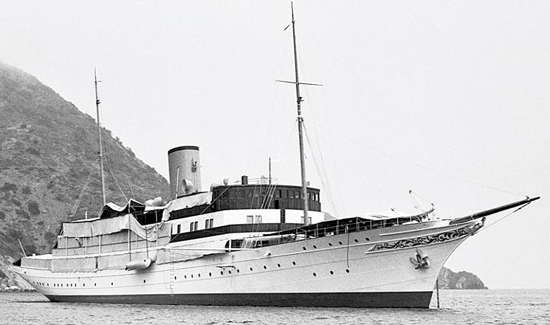 Following the war, Sea Cloud was returned to private ownership, serving as a yacht for numerous people, including Dictator of the Dominican Republic Rafael Trujillo. The ship currently sails as a cruise ship based out of Europe. 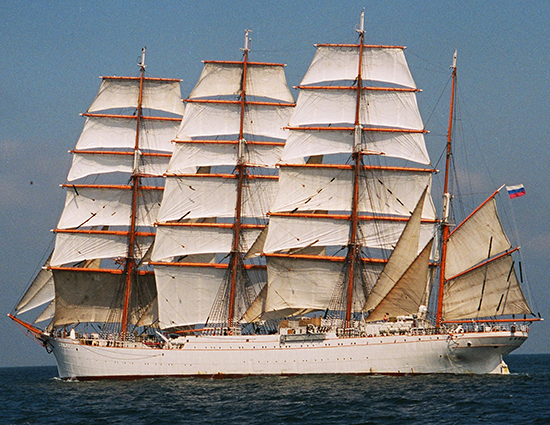 SEDOV - world's biggest sailboat. Length: 117.5 m. Launched at Kiel, Germany in 1921 by the Friedrich Krupp Germaniawerft. 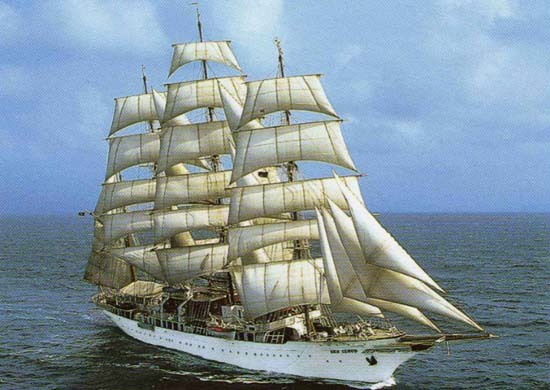 Four-masted steel barque that for almost 80 years was the largest traditional sailing ship in operation. SERENE - 440 ft / 134 m / 500 mio. (owned by Mohammad bin Salman Al Saud). 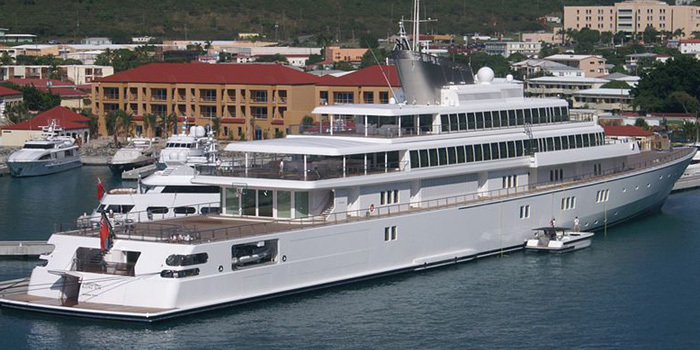 Seven Seas - 280 ft / 85 m (owned by Steven Spielberg). SILVER - 241 ft / 73 m (available for charter for between $200,000 and $500,000 per week plus expenses). Skat - 233 ft / 71 m (owned by the Charles Simonyi). Southern Cross - 425 ft / 130 m. Built by American tycoon Howard Hughes at a cost of US$3 million beginning of the 1930s, then the largest private yacht in the world, and sold to Swedish entrepreneur Axel Wenner-Gren in 1939, one of the wealthiest men in the world during the 1930s. SOULMATES II - 197 ft / 60 m.
SOVEREIGN - 100 meter superyacht by Gray Design. Strand Craft - Strand Craft 122 super yacht comes with supercar and in-boat garage to hold it. Sunrays - 280 ft / 85 m.
SUNSEEKER PREDATOR 108 SPECIAL EDITION - Caterham Cars and Sunseeker International, have formed a unique alliance to create the ultimate expression of the millionaire lifestyle. Capable of storing and launching a Caterham Seven sportscar at the stern. Costs from around £7.1 million, plus a road-going Caterham Seven which starts from £12,995. SYCARA IV - 151 ft / 46 m. Styled after the classic yachts of the 1920’s' Golden Age of yachting. Symmetry - 590 ft / 180 m. Made up of six decks, Symmetry has 10,700 sq feet of exterior deck space, a garden and a saltwater pool. Talitha G - built 1927. 271 ft / 82 m (owned by the Getty family). 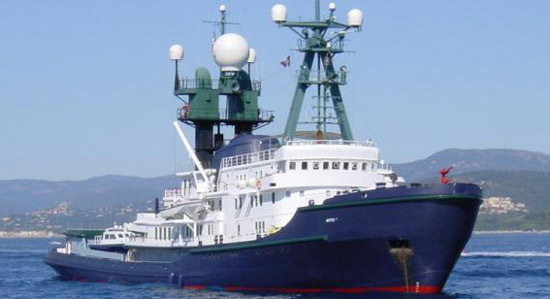 TATOOSH - 303 ft / 92 m / 125 mio. (owned by Paul Allen). TERRA WIND RV - luxury amphibious motor coach / yacht: US$850,000-US$1.2 mio. 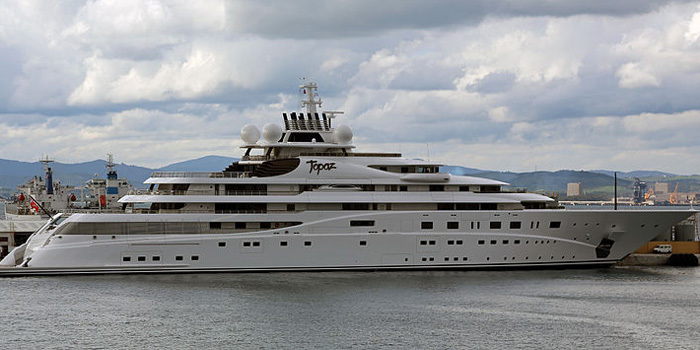 Topaz - 482 ft / 147 m / £400 / US$680 mio. Fifth largest superyacht in the world. Owned by Abu Dhabi’s Sheikh Mansour bin Zayed Al Nahyan. Tueq - 257 ft / 78 m / 55 mio. Turama - 380 ft / 116 m (owned by the Latsis family). 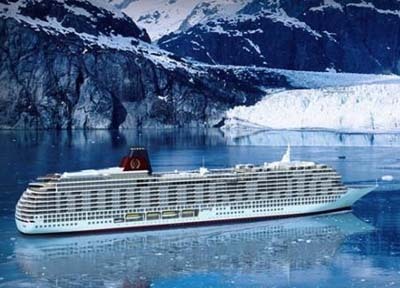 UTOPIA - luxury residential ocean liner: US$1.1 billion. Due to be delivered by Samsung Heavy Industries by 2016. VAJOLIROJA - 156 ft / 48 m. Actor Johnny Depp's own 'Pirate of the Caribbean' yacht. Vava II - 315 ft / 96 m / £100 mio. (owned by Ernesto Bertarelli). VENUS - 260 ft / 79 m / £100 mio. Late Steve Job's Philippe Starck designed yacht. VERTIGO - 220 ft / 67 m. 2012 winner - World Superyacht Awards. 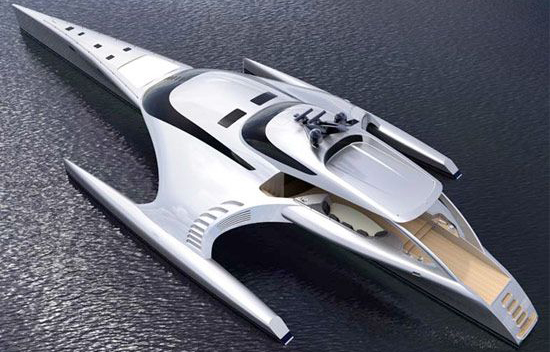 WALLY 118 POWER YACHT - sells for US$24.83 mio. White Pearl - largest sailing yacht in world. 468 ft / 144 m / US$400 million. Designed by Philippe Starck. Owner: Russian billionaire Andrey Melnichenko. World is not Enough - 139 ft / 42 m. Speed: 70 Knots. Helm Deck: Encompasses primary navigation bridge, Captain's cabin, Engineer's cabin, sky lounge with wet bar and entertainment center, and aft deck lounging area with retractable sun awning. Helm area includes Helm seat, two double wide observer seats, fully integrated helm station and electronics, Helm Dinette (seats 4-6). Main Deck: Luxurious owners cabin forward with walk in closets, his and her baths, Jacuzzi Tub, and shower, galley with country kitchen (seats 8) appliances include SubZero and Miele, dining room (seats 10), main saloon, entry foyer, and aft deck entertainment area with built in settees and tables and retractable sun awning. XSR48 - a supercar on water. Yacht Island Design - "Introducing the new concept in luxury yachting: The Yacht Island." YAS - 463 ft / 141 m.